Simplifying image geocoding on digital imaging workflow for photographers, photo journalists, stock photo agencies, libraries and image funds companies: geotagging where you took pictures. 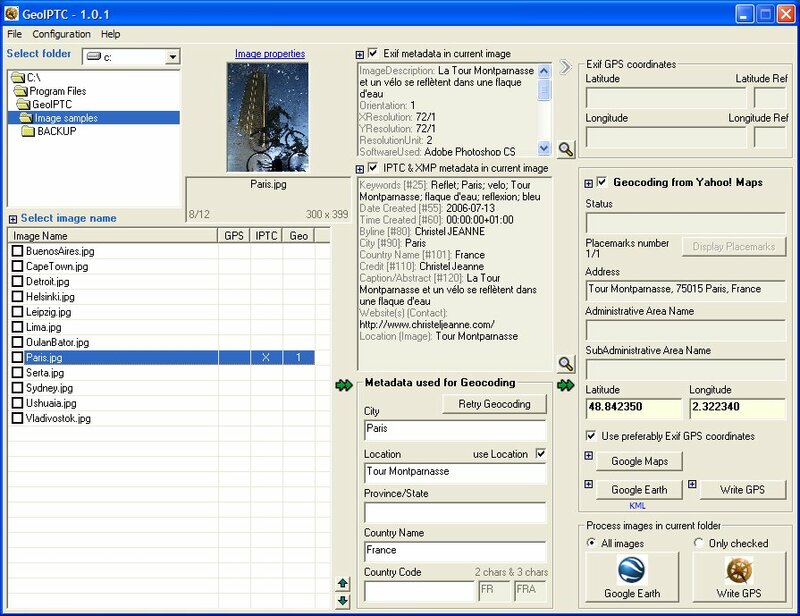 GeoIPTC is an innovative tool to add geographical identification to your images (geocoding) according to IPTC and XMP metadata embedded in images. GeoIPTC reads all IPTC and IPTC Core metadata embedded in an image, isolates localisation data (City, Location, Province/State, Country Code and Country Name), then sends a request to a Geocoding Web Service and finally gets latitude/longitude coordinates. To say it briefly: GeoIPTC gets geographical information from the “postman address” embedded in image. Automatically gets longitude/latitude from widely used Geocoding Web Services like Google Maps, Yahoo! Maps or GeoNames. GeoIPTC is a Windows application running on 2000, XP, 2003, Vista. Caution: if you experience a problem with Microsoft XML parser version 6 (MSXML6) not installed, please download it first, install it and after run GeoIPTC. 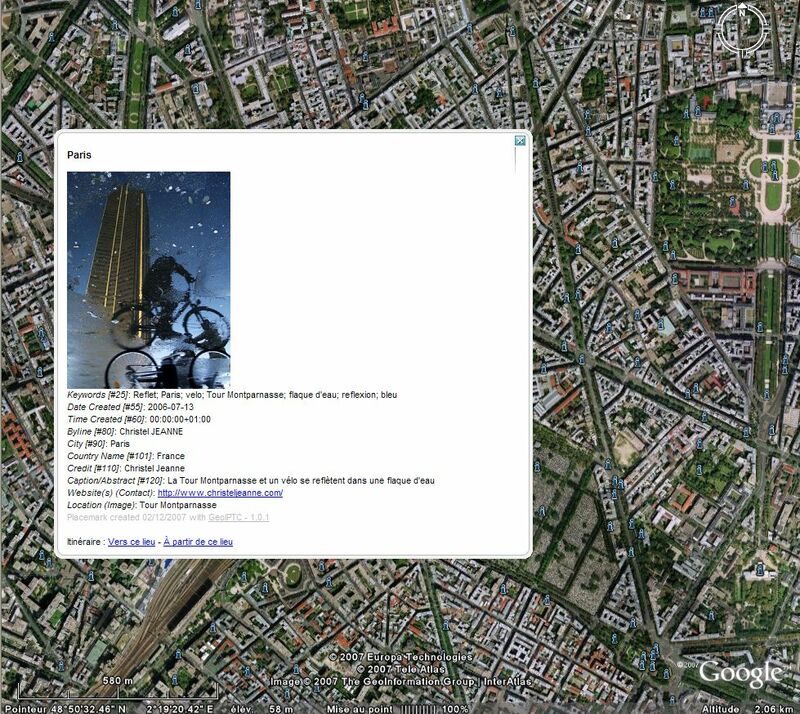 Then the program gets latitude/longitude from a Geocoding Web Services allowing to show the placemark on a Maps Service or on Google Earth (see below) or to generate Exif GPS data inside the image file. Buy your GeoIPTC now and start experiencing all benefits in the next hours (only 65 Euros). We can help you developping your images database: XMP proprietary schemas, custom panels, DBSight integration, etc. Your suggestions and comments are welcome. share good practices of your well annotated photos when you share your pictures.